Sydney is Australia’s number one travel destination in terms of number of visitors. 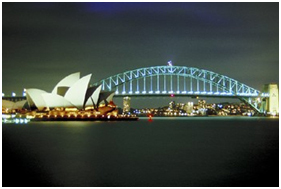 Admire and climb the spectacular Harbour Bridge during the day or night. Sydney is the best place for cruises, outdoor adventures like wildlife and ecological tours. The Sydney Opera House was completed in the 1960's. The unique design for the facility, coupled with the excellent acoustics, make this cultural icon a must see stop that even persons who are not interested in opera will enjoy. The beaches provide some of the most beautiful ocean side playgrounds in the entire world. Visitors can spend endless hours enjoying the sun and pristine sands and then enjoy tours into some of the surrounding bush areas. Blue Mountains a short 2-3 hours drive from the CBD make Sydney the most-opted of all places in Australia Night out on the town is easy to manage, with an array of night spots that will accommodate just about every interest. The Sydney Aquarium, one of the largest in the world, the Australian National Maritime Museum, the Chinese Garden, the IMAX cinema, and the Powerhouse Museum are a few of the other spots here. Built from the shell of an old power station constructed in 1899-1902, the Powerhouse Museum is a "must visit" for those with a voracious appetite for knowledge and information.